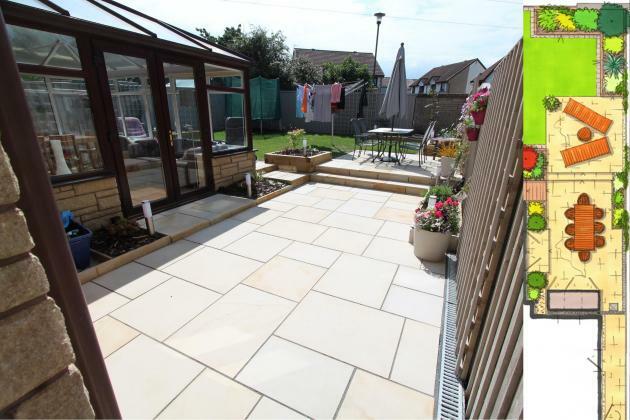 This client wanted a crisp and durable large outdoor space to continue the tiled neat interior of their new conservatory out into the garden. The material had to have a wow factor without a maintenance liability. We used dressed and textured stone paving for sharp details, a perfect level surface and neat steps and edges. This client had to trust the value of the added expense of using this type of product and was delighted with the result. The design and layout resolved all the issues of this garden, brought out all the potential and the material choice delivered the wow where it would be appreciated.